The story of the Black Prince dates back to the historical Ayutthaya period. 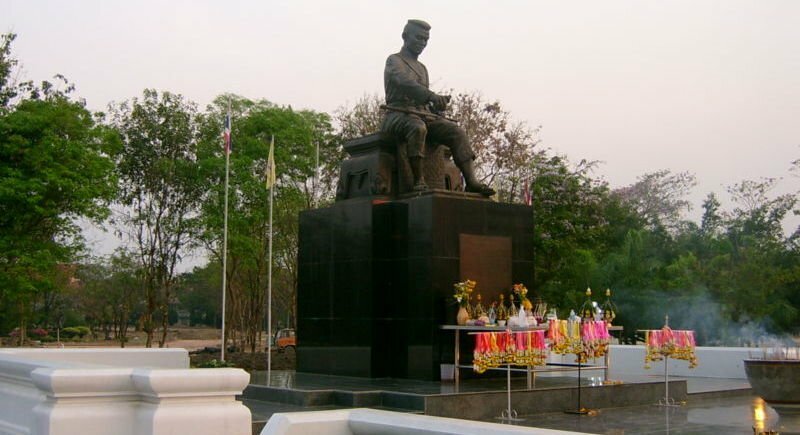 The Black Prince was another name for Prince Naresuan (in Thai – Ong Dam) who was born in Phitsanlunok in 1555. His brother Ekathotsarot was called the White Prince. A depiction of the battle between the Siamese and Burmese armies. In contrast to his brother, Prince Naresuan was more lenient and less rigid. 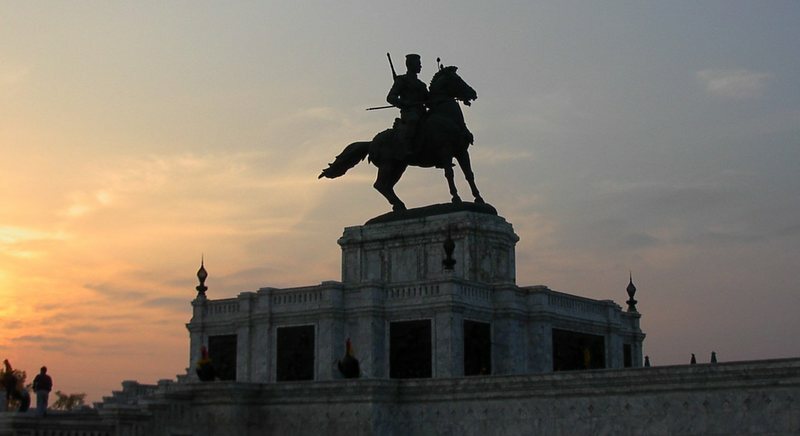 He was captured by the Burmese and thus raised alongside the Burmese royalty, among them Crown Prince Mingyi Swa. Naresuan was an intelligent boy who was educated in the style of early modern warfare by the Burmese. 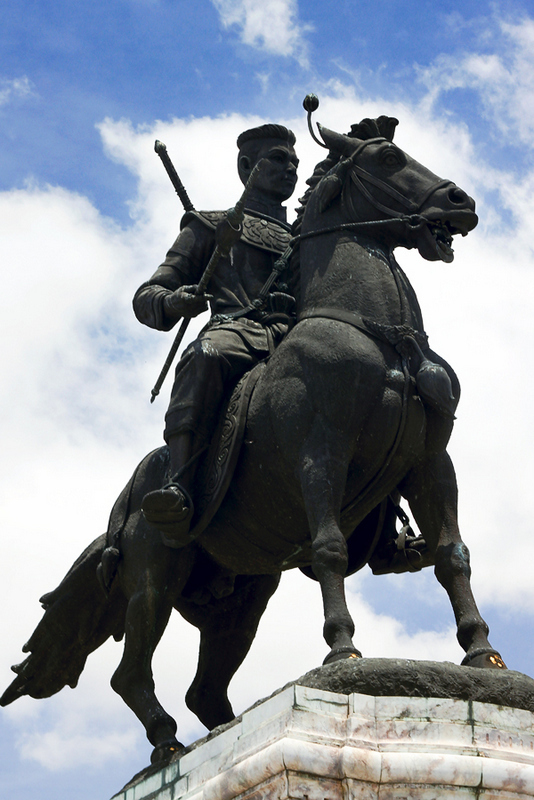 When the Black Prince was a young man, the Burmese King trusted him to such an extent that he gave him permission to train an army of captured Thai soldiers. The Prince affectionately called his men Naresuan’s Wild Tigers. Thus, the Wild Tigers became increasingly powerful and one day they turned on their Burmese captors and defeated them before returning triumphantly back to Siam. Soon after this event, the Black Prince was crowned King Naresuan of Siam and reclaimed the sovereignty of Siam. His first major challenge was with his former hosts and guardians. A giant enemy force of Burmese soldiers amassed near the border between Siam and Burma. Naresuan ordered his people in the north to withdraw and burn their rice fields. The farmers thus fled to Ayutthaya and the new king drafted every able-bodied man into his army. For both Siam and Burma, the war was very painful, however, neither army would give in to the other. One day, King Naresuan’s war elephant was startled and ran madly into the enemy lines. When the dust from the elephant’s tracks cleared, the king realised that he was facing his enemy, the Burmese crown prince. The king was surrounded by a large force of enemy soldiers. The Burmese prince could have ordered his death but instead accepted Naresuan’s challenge to a duel. This was the legendary Elephant Battle in which the two opponents fought with swords and spears from the back of their war elephants. The legend tells that when the Burmese prince urged his elephant forward, Naresuan swung his sword and mortally wounded the prince. King Naresuan thus declared an armistice while the Burmese soldiers removed the body of their slain prince from the battlefield. It seemed that the king still admired his opponent whom he had been forced to kill. 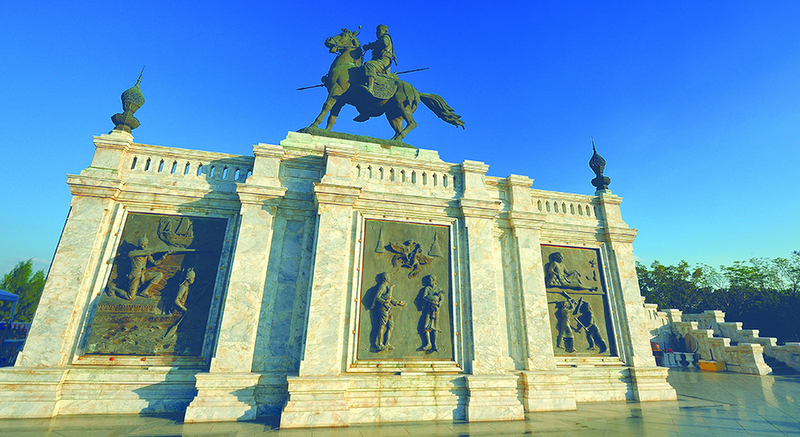 Thus, on their battleground he built a memorial chedi to honour the Burmese prince Mingyi Swa, his childhood friend. 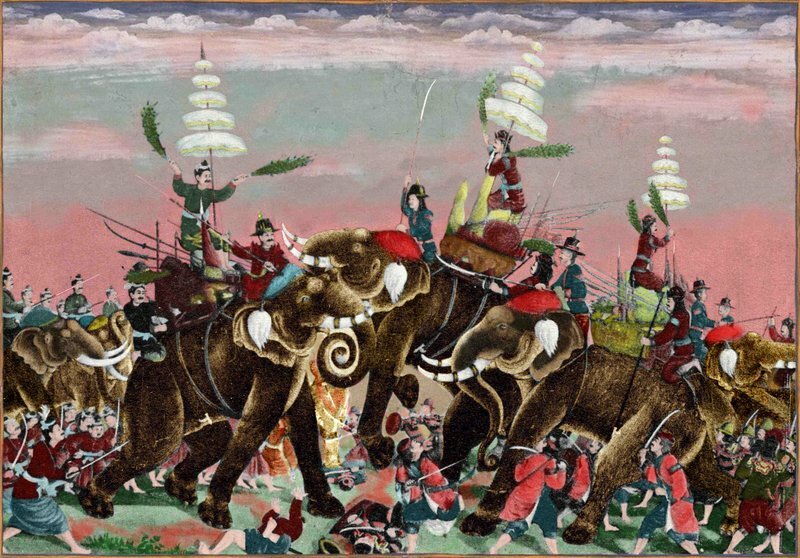 The famous Elephant Battle took place on January 25, 1592, at Nong Sarai field in Suphan Buri. With their crown prince dead, the Burmese had no one to lead them and they lost heart for the battle. In consequence, they withdrew their forces and for a time the Burmese people and the people of Siam enjoyed a time of peace. King Naresuan died in 1605 at age 49. Finally, I must confess that I’m not such a great fan of historical movies because I often find them too strenuous. 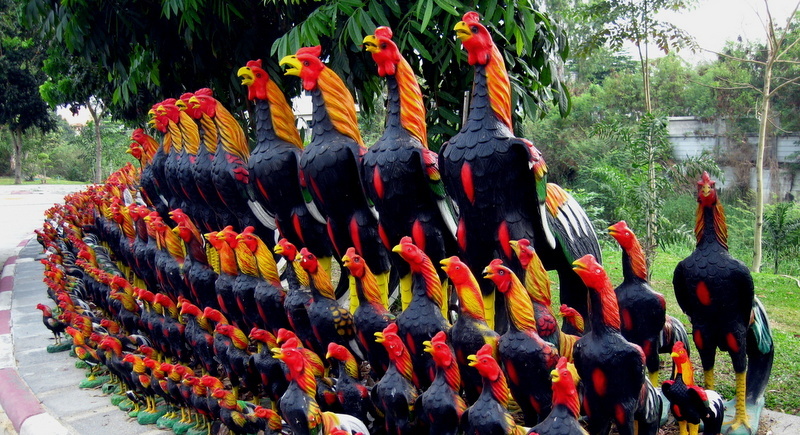 But the legend of King Naresuan has been portrayed on film and was directed by HSH Prince Chatrichalerm Yukol. It was made in six parts and stars Wanchana Sawatdee as Naresuan. So dispite my usual dislike of the genre, I found this movie quite interesting and useful for my research. I urge you to track down a copy and watch it to learn more about the legendary Black Prince. Sirinya Pakditawan is a ‘luk kreung’, or half-Thai, born and raised in Hamburg, Germany. She enjoys writing about Thailand, with a focus is on culture, art, history, tradition and on the people, as well as a mix of topics concerning Thai popular culture, travelogues and articles about Thai food.